John McLaughlin, Untitled (1952), Oil on canvas. Greenberg Van Doren Gallery. 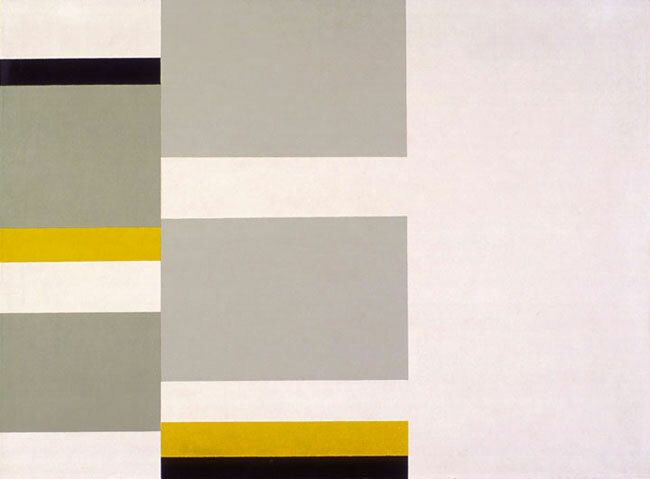 The late great California abstract painter John McLaughlin (1898-1976) is one of my favorite artists. He was mostly self-taught, and didn’t begin painting until he was nearly 50. When he did, he created an astonishing body of intensely beautiful geometric abstract paintings, along with collages and prints. The images here don’t do the paintings justice — you really need to see his work in person. McLaughlin is not nearly as well-known as he should be, but I think eventually he will be regarded as one of the great masters of 20th Century art, not merely an “early Los Angeles” “hard-edge” minimalist grandfather of what came in the 1960s. And he is no minimalist, as his exquisite use of color alone confirms. Shapes are geometric, mostly rectangles like the canvas or paper support. Paint application is smooth, uniform and flat, edges crisply defined. Black, white, gray and neutral taupe are common, but so are limpid hues — especially sky blue, vivid yellow and crimson, plus an occasional green. The colors are a distinctive variation on Mondrian’s enthusiasm for the endless possibility available from the primaries. What McLaughlin did with these stripped-down tools remains one of the great achievements in 20th century American art. Ignoring accepted rules, his sophisticated paintings pry open perceptual space. Almost surreptitiously, they grab hold of your optical apparatus and undermine conventional habits of seeing. Here’s how: The paintings work against the natural tendencies of binocular vision. You’ve got two eyes and a brain, and they conspire to create depth perception and parallax vision, allowing us to see the world in three-dimensional motion. McLaughlin pulled the plug on that. A typical McLaughlin canvas chucks established notions of good composition. Most of his paintings are divided right down the middle, forming roughly equal halves. The right-left division is sometimes made by juxtaposing pairs or groups of rectangles. Other times, one or more vertical bars cut the picture in two. Occasionally, the bars are wide horizontals — so wide that your eyes can’t take in both ends at once. Sometimes a square is centered within a horizontally rectangular canvas. Then, the “empty” space at either side functions the way painted vertical rectangles do in other works: Each eye latches onto one, and the natural tendency for vision to converge in the middle is thwarted. It’s as if the painting is forcing your two eyes apart, letting light and space rush in to fill the yawning void that opens up. In our era of cool distance, separation, irony, mass-production, and art-for-money’s-sake cynicism, the paintings of John McLaughlin are a tonic, and serve as a reminder of what can be accomplished by one person with a clear mind, conviction of purpose, and a lot of dedicated hard work. 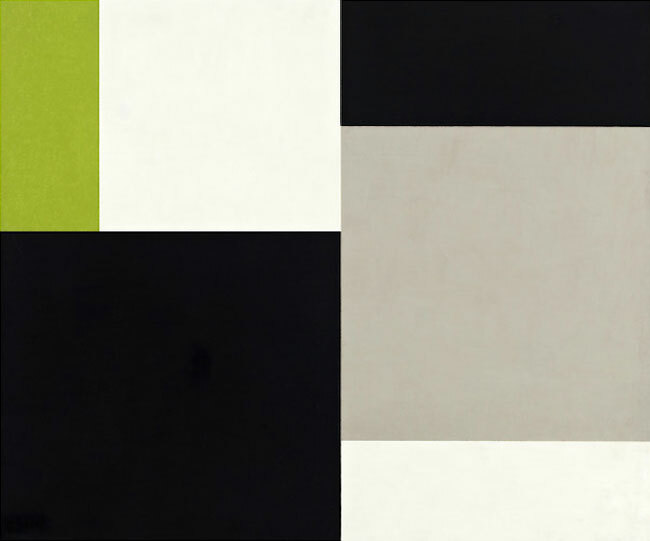 John McLaughlin, Untitled (1956), Oil on canvas. Long Beach Museum of Art.